Kaanaanmaa is your local, independent jewellers established in Wokingham since 1976. We are a team of skilled goldsmiths who specialise in creating unique, high quality jewellery for our customers. Kaanaanmaa is owned by Stephen and Gary who have each worked at the shop for over 25 years and bought the business in 2001. Both qualified from the Sir John Cass Faculty of Arts in London. At Kaanaanmaa we offer a range of superb jewellery with high quality design and workmanship together with exceptional service at an affordable price. We specialise in creating unique engagement rings and wedding rings to your design and budget. We are proud to offer our hand-picked selection of conflict free diamonds and ethically sourced gem stones. Whether you require a wide selection of designs to choose from, or have an idea for your own bespoke design, or, should you need repairs made to an existing piece, we are proud to offer a personalised service to meet your needs. 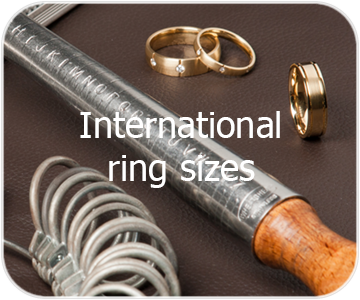 Our wedding ring range includes 9, 18 and 22 carat yellow gold; 9 and 18 carat rose or white gold; platinum; and diamond set bands. We have over one hundred models in stock for you to try on to find your personal favourite. Come in and talk to us today to discuss your needs.